The pirate known as Blackbeard is perhaps the most famous pirate in the Americas. His career lasted a scant 27 months, but his name is one of the most prominent in pirate legends. This fame helped prompt Stan Lee and Jack Kirby's story for Fantastic Four #5 -- where Reed, Ben and Johnny are sent back in time by Dr. Doom to retrieve Blackbeard's treasure. I doubt Lee and Kirby paid much attention to the details of the real Blackbeard's life and tried to faithfully incorporate the Thing into the already existing legends. But did they inadvertently do just that anyway? With the knowledge we have of the dreaded pirate, could Ben slip into the legendary role of Blackbeard as easily as Lee and Kirby implied? What we know of Edward Teach, the man who has been named Blackbeard by history, is sketchy at best. Almost everything about him prior to his becoming a privateer in 1713 is a mystery. He took up with Captain Hornigold, who trained Blackbeard in the art of piracy. In 1716, Horningold soon gave Teach his own ship, the Queen Anne's Revenge, and accepted a general amnesty to Teach's disgust. Blackbeard then set out on his comparitively well-documented capaign in the Bahamas. Supposedly Blackbeard stood at six foot four and weighed 250 pounds. As most measurement devices were relatively inaccurate in the 1700s, it stands to reason that Ben's height could have been mismeasured by four inches and any scale he would have stepped on is unlikely to have gone beyond 250 pounds. (The Official Handbook of the Marvel Universe puts the Thing at six feet and 500 pounds.) It is also quite conceivable that Blackbeard was never even measured, but men had estimated his height and weight compared to their own. In fact, most of the descriptions of the historical Blackbeard focus so intently on his long, dark beard that they neglect to mention much else. Blackbeard was known for his physical prowess. On a long boring day, he shouted to his crew, "Come, let's make a hell of our own, and try how long we can bear it." Taking three crewmen below deck, he lit several large pots of sulfur and closed the hatches. The three men nearly choked to death before rushing back to the deck, but Blackbeard remained below dancing and laughing in the smoke for several more minutes. On other occassions, he was known to prepare for battle by mixing gunpowder and rum, lighting the unusual beverage, and drinking the still-flaming concontion. His lungs and stomach were obviously far more powerful than an average pirate's. When pirate-hunter Robert Maynard boarded Blackbeard's ship, Maynard confronted the pirate directly. They immediately fired at each; Blackbeard missed his mark, while Maynard's shot landed square in Teach's chest. Maynard began to rejoice in his easy victory, before realizing that the shot barely stunned the pirate. Their intense battle continued and when Blackbeard finally fell, Maynard's crew counted five gunshot wounds, at least twenty deep stab wounds, and a sliced throat. Very few men could have endured such a multitude of wounds in one battle. Ben could easily have possessed these strengths associated with Blackbeard, but what of Blackbeard's personailty? As a hero, Ben would seemingly be reluctant to take up a pirate's greedy and bloodthirsty attitudes. However, Ben was still becoming accustomed to his rocky hide since it was so early in his career as the Thing. The acceptance the other pirates gave him could easily have swayed Ben to take up a new life in history, as Lee and Kirby show in the story itself. And, while Blackbeard was a pirate, he still went to great pains to keep his men healthy and happy. His capture of Charleston, North Carolina for example was simply to obtain medicine for an outbreak of veneral disease that threatened his crew. There are a few inconsistences that bear mentioning however. No record mentions Blackbeard wearing an eyepatch as Ben does in the story. Blackbeard may have only used it occassionally, or perhaps his beard (which he infused with lit gunners' matches during battle to frighten his opponents) was distracting enough for people not to notice it. Ben could have easliy lied about his prior privateering career; such records were difficult to verify. Blackbeard was supposed to have had fourteen wives, which is not generally in line with Ben's thinking after he later established his monogomous relationship with Alicia Masters, but Ben did make a comment to support this flirtatious thinking within the story: "Ahoy, Matey! Let's see if we can date one of these pretty barmaids! Heh heh!" Timing would seem to be the most critical issue. Could Ben have spent over two years as Blackbeard? Initial reading of the story would determine that the timing would have been impossible. But several possibilites arise that could entirely resolve those issues. The story as it stands takes place over the course of forty-eight hours, but there are two instances where we can place portions of Blackbeard's adventures within the context of the story. The first is between pages 16 and 17. Although the story seems to flow nearly seemlessly, running from a discussion of foiling Dr. Doom's plot to Ben's insistence on staying behind, it is conceivable that a majority of Blackbeard's adventures took place during this time. Dr. Doom originally gave the trio only two days to return with the treasure. That time could have easily ended between the pages in question and, had Ben stayed behind with the chest, Reed and Johnny would have pleaded with Dr. Doom to send them back again for the remainder of Blackbeard's career, arguing that the passage of that time for Doom would be neglible. Doom's character could have been amused easily by pulling Ben back to his tormented life in the present and he would have granted the request. Reed and Johnny could have spent the next several months in search of their comrade before finally finding him and winding up on his ship once more. As mentioned earlier, Blackbeard died at the hands of Robert Maynard, not by the hurricane that destroys his ship in the story. This final battle could have taken place between panels five and six on page 18 while Reed and Johnny were recovering. Ben could have pulled himself onto one of Blackbeard's other ship after the twister destroyed the one shown in Lee and Kirby's story, going on to confront Maynard. During the fight Ben may have realized who he had become and decided to find Reed and Johnny to return to their proper time. Feigning death would have been easy (his thick, rocky hide prevents anyone from hearing his heartbeat) and he could have jumped ship as the battle waned. A shocked Maynard may have picked up Ben's discarded beard and placed it on another pirate's head to claim victory. Although the body types would have varied considerably, Maynard is recorded to have severed the villain's head and placed it on his ship's bowsprit to announce his victory to the nearby Carolinas while the remainder of Blackbeard's crew was hanged. Another distinct possibility is that the story stands as it was presented. However at some later point in his career, Ben could have used any number of time travel devices to return to the moment when he originally left and resumed his role for the next twenty-seven months. The Thing that was supposedly killed in 2099: World of Tomorrow #1 may have encountered a rift in time or Ben could have voluntarily returned during one of his many bouts of depression. He could of course return to the 1700s at some undetermined point in his future as well. It's entirely plausible too that Marvel's Blackbeard was not Ben Grimm at all. After making an impression during his first trip in time, another pirate may picked up the mantle that Ben helped create. Perhaps Reed Richards of Alternate Earth (Fantastic Four #118) learned of Ben's brief second identity and choose to continue that role himself. Sharon Ventura had evolved into a Thing-like beast; she may have gone back in time to hide herself from the embarassment of facing Ben again after she aided the Frightful Four. (Fantastic Four Unlimited #5) Of course, there is the possibility of any pirate finding the Temple of the Ancient Sun Demons in Brazil (Fantastic Four #403) and taking a Thing-like form for himself. 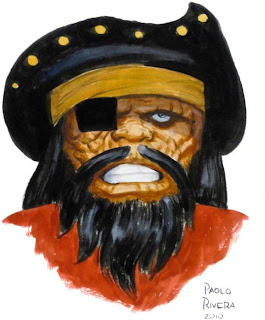 Obviously, there is no definitive proof that the legendary pirate Blackbeard and Ben Grimm are the same person. I have merely shown that they could have been. Until a new writer devises a canonical story based on one the ideas presented here (or an entirely new one), we can only speculate at Marvel's legends of bygone eras.